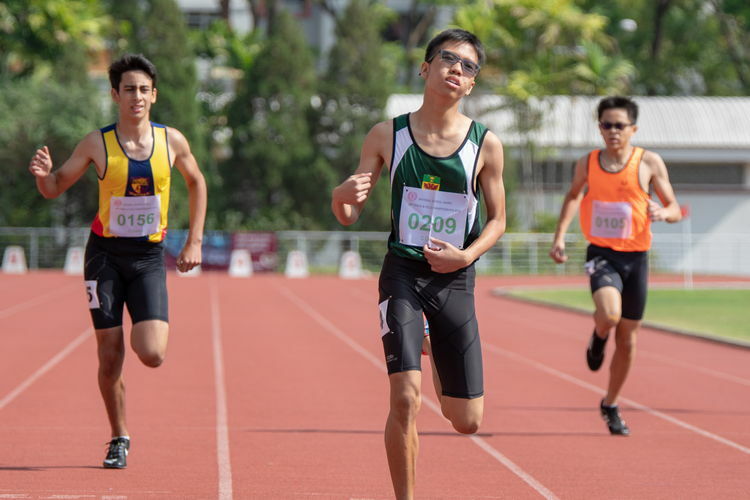 Choa Chu Kang Stadium, Friday, March 15, 2019 — Raffles Institution’s (RI) Caleb Loy powered through the C Division boys’ 400-metre final to take home the gold, overtaking Anglo-Chinese School (Independent)’s Rayan Bagheri Aghdam in the last 50 metres at the 60th National Schools Track and Field Championships. Caleb crossed the finish line in a timing of 53.87 seconds, beating his previous personal best of 55.55s achieved in the semi-finals. The race was a close fight between Caleb and ACS(I)’s Rayan, the latter holding the lead for the initial stages of the race. While it seemed that Rayan would hold on to the lead, Caleb soon started to catch up right after the last bend. “I was actually quite scared, because my coach wanted me to win this race. When I came out of the curve (Rayan) was in front of me. My coach gave me this piece of advice — he told me to ‘talk to myself’, to motivate myself, so that’s exactly what I did,” Caleb said, smiling as he recounted his race. The self-motivation proved enough for Caleb, the Secondary 2 school student pulling away from Rayan in the last 50 metres. Crossing the line, Caleb finished almost a whole second ahead of Rayan, who placed second with a timing of 54.81s. “Our ultimate aim was to get a gold here, so I think that because I reached that, I am quite happy. It’s quite rewarding, especially since I trained a lot the past year,” said Caleb, reflecting on his training. Caleb admitted that he did face some pressure going into today’s race, especially with the pressure of qualifying fastest from the semi-finals. “I had a lot of friends who wanted me to win today, especially since I qualified first in the semis. I was more confident going into today’s race than coming into the heats,” he added, laughing. Speaking about the rest of the competitors, Caleb had nothing but words of encouragement.